BlendAirTM uses spinning disks to create a vortex to efficiently mix solids or liquids and/or transfer gases into water. Mounted on a single high speed rotating shaft, two sets of opposing disks simply create an upper vortex and a bottom vortex that draws air or other gases down from the tank’s headspace into the water and mixes the tank. Compared to compressed air aeration, BlendAir provides aggressive aeration without causing high shear in the bulk liquid. High shear on the disks prevent surface fouling, but low shear in the mix tank protects fragile flocs or liquid polymers. Since BlendAir has disks but not blades, only a small motor for rotation is required to spin the disks, thus consuming less energy. No blades also means that BlendAir is inherently safer and is less prone to cutting or damaging equipment or people. BlendAir can increase reaction rates, reduce tank volume requirements, and minimize chemical dosage. By drawing headspace gas into the liquid, BlendAir averts problems that conventional mix systems suffer such as foaming, release of odours or fumes, or splattering of aerosols. Low energy and easy maintenance requirements with BlendAir minimize on-going costs compared to operating compressors or blowers and air diffusers. 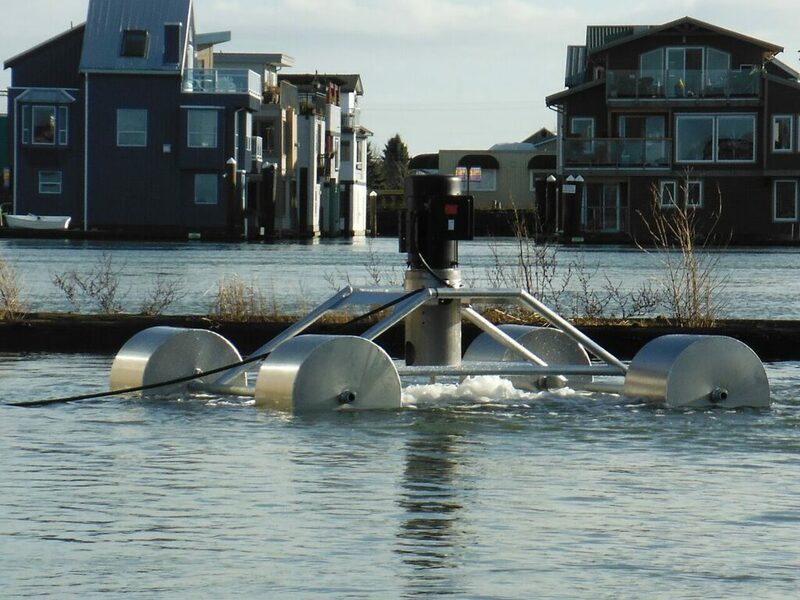 BlendAir may be top-, side-, or bottom-mounted and can be retrofit onto existing tanks or installed on lakes, ponds or lagoons.